Summer days shorten as Fall makes its appearance in a bold splash of color. The once green mountains explode in in reds and yellows and oranges that remind transplanted easterners of home. 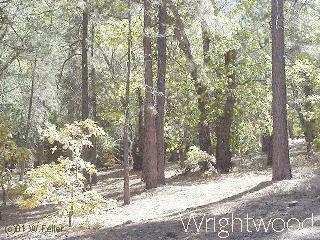 Then Wrightwood is showered in gold as stately oaks and graceful poplars send their leaves to the winds. Once again there's a chill in the air. Acorns and perfectly shaped pinecones fall while small animals and residents prepare.